Dressage, the equestrian practice in which a horse makes highly precise movements in response to barely perceptible signals from the rider, has taken hold of equestrians worldwide. Participation rates have risen by 200 percent over the past twenty years, as baby-boomer riders have discovered dressage to be less strenuous and dangerous than jumping, yet offering the satisfaction of mastering techniques and the opportunity to compete and advance to higher levels of achievement. 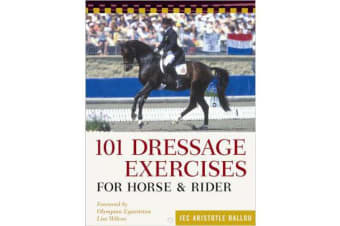 “101 Dressage Exercises For Horse and Rider”, presented in Storey’s highly visual “Read & Ride” format, features a full arena diagram and step-by-step instructions for each exercise. The exercises address all levels of riders, starting with the basics and moving up to manoeuvres developed by members of the U.S. Olympic team. Training tips and masterly guidance make this an indispensable reference for all dressage riders. Even Western riders interested in enhancing their performance will find these foundational exercises useful. Dressage riders are information-hungry readers, often referred to as “the thinking horsemen.” This book’s sturdy format, comb-bound and drilled so it can be hung on a ring-side post, will appeal to these reading riders, whether in or out of the saddle.